Students enrolled in a patent application course in the Department of Chemistry and Biochemistry assisted Dr. Matibur Zamadar in filing a patent for an invention that could slow or stop progress of certain cancers. 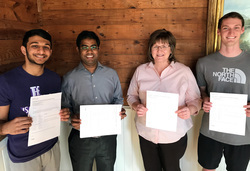 From left, senior chemistry major Aqeeb Ali of Richmond; Zamadar, associate professor in the department; Dr. Michele Harris, professor and assistant chair; and senior chemistry major Jacob Herschmann of Spring display patent application documentation. NACOGDOCHES, Texas - Stephen F. Austin State University students enrolled in a patent application course gained first-hand experience with international patent applications by assisting with a patent for an SFA faculty member's invention that could slow or stop progress of certain cancers. Dr. Matibur Zamadar, assistant professor in SFA's Department of Chemistry and Biochemistry, is the owner and developer of novel chemotherapeutic compositions and methods that could benefit cancer patients, and he allowed students to shadow and assist in the patent application process. "All students were required to sign non-disclosure agreements and have searched for patents and technical publications," said Dr. Michele Harris, SFA professor and mentor to the patent application students. "They have observed the process of taking Dr. Zamadar's manuscript about his invention and starting the patent application and drafting of patent claims." Tom Pruitt, retired patent attorney of Nacogdoches, assisted with drafting the application and spoke to the class, provided material for it and hired students as short-term interns. "It has truly been a unique experience for this group of students, and Mr. Pruitt has gone above and beyond in giving of his time, expertise and resources," Harris said. Pruitt said he and his wife, Deborah, have an interest in encouraging education in intellectual property which stems from their desire to "give back to society in a unique way." "STEM innovation is encouraged by patenting," Pruitt said. "It begs for focused, new training programs. SFA STEM students will be better prepared for their generation to decide how best to do what is best." Celeste Keith, a graduate student from Santa Fe, Texas, worked on a small team writing a patent with the assistance of Pruitt. Keith now plans to pursue a career as a patent agent and to take the patent bar exam. "The class influenced that decision quite a bit," Keith said. "I had no idea the career existed prior to the course. Once I started learning more about the field, it really caught my interest." For more information about SFA's STEM program, visit sfasu.edu/academics/colleges/sciences-math.